This low expansion PUR FILL 1G foam is used to seal and prevent air leaks as well as the passage of fibers, water, sound, and dust into a home or building. In addition, this foam limits the amount of places where insects can come in. The PUR FILL 1G foam is rigid, closed cell foam that is applied with a foam gun. One 750 ml can (32 ounces, 870 grams) of this foam creates cured foam measuring 2,820 cubic inches. Also, it provides 1,200 linear feet of 1/2-inch bead. Within ten minutes the foam is tack-free, and within thirty minutes it is trimmable. 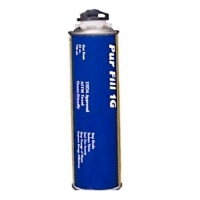 PUR FILL 1G foam reduces foam consumption by 25 percent compared to foam that is dispensed through an aerosol valve. NOTE: The PUR FILL 1G foam does not include an application gun. The foam gun may be acquired as a separate purchase (see related products).